The Witch is one of the Mystical Golf’s three courses, and many consider it to be one of the most enjoyable Myrtle Beach golf courses. The Witch spans over 500 scenic acres and famed golf course architect, Dan Maples, made perfect use of the pristine land. The Witch is a highly awarded golf course that features dense forests and pristine wetlands as you navigate through the challenging but fun course. The golf course offers a serene setting as it is not surrounded by homes, condos or other development. This Lowcountry golf course has over 4,000 feet of bridges that are needed to maneuver through this beautiful nature preserve. Golfers of all skill levels will enjoy this course and don’t forget to take advantage of the great Myrtle Beach golf photo opportunities. 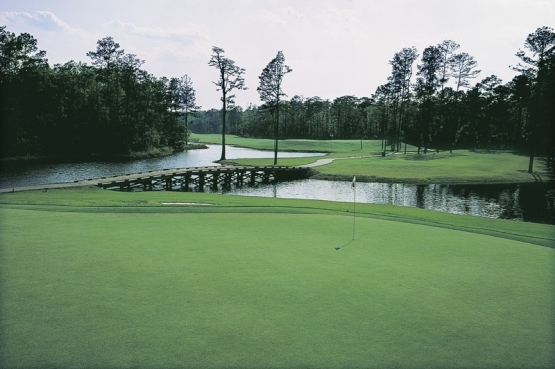 Myrtle Beach Golf Authority golf packages can make booking a Myrtle Beach vacation easy. Myrtle Beach Golf Authority has the very finest Myrtle Beach accommodations and North Myrtle Beach accommodations. The moderate Myrtle Beach weather allows visitors to enjoy many of the Myrtle Beach attractions such as The Myrtle Beach Boardwalk, Myrtle Beach Sky Wheel, Broadway at the Beach and Barefoot Landing. When visiting Myrtle Beach you might want to tune up your golf game with a renowned Myrtle Beach golf instructor and a Myrtle Beach golf lesson. The outstanding golf courses, beautiful weather and Southern hospitality are just waiting for you to book your Myrtle Beach golf package! The Witch is a beautiful track to play. Cut in the middle of the woods makes this little gem worth playing. Although when you drive up to park your car, don't be fooled by the state of the starting area. Staff are very good.